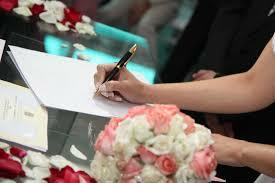 When making plans for a wedding, most people tend to focus on the significant parts, only to miss some little details. Most of these small details are often taken for granted, but they make a big difference when they miss. This write-up shares some small details you should not overlook when making plans for your wedding day. You do not want to have an experience where your guests will be lost. As much as everything might seem clear to you, you should always take some time and spell everything out for them. You might add directions or a link on Google Maps, but you certainly need some strategically placed signage for each spot. You surely need a guest book at your wedding. However, it is not just about having a book and a bunch of pens, embrace some creativity and make the guest book fun and interactive. For instance, you might have it strategically placed next to the photo booth, let them take a snap and have them sign beside it. You need some menu cards to complement your theme and some style to your tablescape. The menu cards should be placed around the reception. They are mostly used for formal weddings. If you are planning to offer a multi-course meal, a mini-menu booklet can be ideal. In case you prefer a more laid-back wedding, have the menus displayed in a chalkboard near the reception. As much as you love kids, the last thing you would wish for is a disruption during the ceremony. Thus, you need a plan to have the little ones attended to and entertained. Have an usher at their service to give them toys and engage them with any other fine things. This serves to ensure that they, their parents, and you included have a good time.